Cerumen is the scientific word for that waxy, icky looking substance we all know as ear wax. And instead of being a nuisance, it actually grabs stray dirt, dust, and debris, trapping it before it can go down too far into your ear canal. But the self-cleaning process doesn’t stop there. All day long, while you’re talking, chewing, yawning, etc., those mechanical jaw actions help usher the soiled ear wax to the outside of the ear canal where you can wipe it away with a damp cloth. There’s no reason at all to stick anything like a swab, key, finger, paintbrush, chopstick, iPhone cord or any other foreign object into your ear for ear wax removal. When you do that, it actually sets back your ears own self-cleaning process by shoving old ear wax deeper into the ear canal, impacting it and damaging your hearing. Although nobody ever wants to run across an ear wax flavored Bertie Bott’s Every Flavor jellybean, cerumen (medical-speak for ear wax) has so many health properties that clean, protect and condition your ears. Aside from its dirt-trapping properties, it protects your ears against viruses, fungal infections, bacteria, and even insects! It also moisturizes and conditions the skin inside of the ear canal, keeping it healthy and supple. In fact, special glands inside of your ear canal mix a special recipe of cholesterol, fatty acids, enzymes, alcohols, sebum, sloughed off skin cells, and other chemicals especially for your ears—the end result is ear-protecting ear wax. In fact, average cerumen is slightly acidic—which inhibits fungal and bacterial growth. 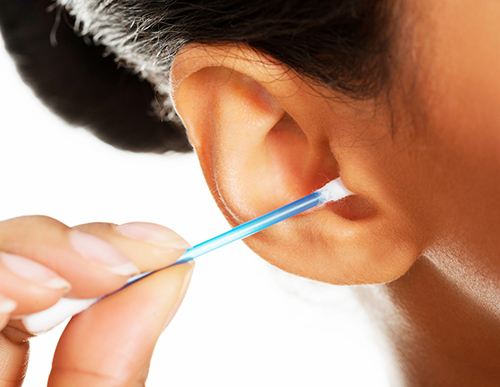 You might already have some level of hearing loss from ear cleaning without even realizing it. If you’ve cleaned your ears with pointy objects for years, it’s likely you do have some impacted ear wax down at the far end of the ear canal, possibly jammed up against your ear drum. The best thing to do is make an appointment with your hearing care professional to have them evaluate your hearing and ear health and have any impacted ear wax removed professionally. On the other hand, some people do actually make excess ear wax, and some people make too little. Sometimes the chemical composition of the ear wax isn’t ideal—it may be too dry or too wet, making it hard for the cerumen to do its job correctly. Either way, it’s still a bad idea to use anything bigger than your elbow for ear wax removal. If you have any concerns about your ears’ cerumen production, again, please schedule an appointment with your hearing care professional. Now, if you need to wear hearing aids, you do need to pay attention to ear wax buildup and proper ear cleaning because sometimes that can impact ear wax into the ear canal. But still—no swabs! That’s why it’s so important to follow your hearing care professional’s recommendations on gentle ear washing and regular cleaning of your hearing aids to keep the balance right and your hearing healthy. Every day, somewhere in America, 34 kids are rushed to the doctor with ear cleaning injuries that can really hurt and also damage their hearing during important developmental years. The most common of these injuries are cuts, lacerations, and ear drum tears. Parents sometimes cause the damage without meaning to, and kids who are just learning hygiene habits can be too aggressive with the swabs. The whole family needs to know that grandma’s “stick nothing smaller than your elbow into your ear” rule applies to everyone. Just take your daily shower and gently towel out your ears to dab away the excess water afterward. This is usually all you really need to do to play your part in the ear cleaning process as your ears do the rest of it on their own. If you are coming off of years of swabbing your ears, it’s a good idea to schedule an appointment with your hearing care professional to see if any impacted ear wax is dulling your hearing.